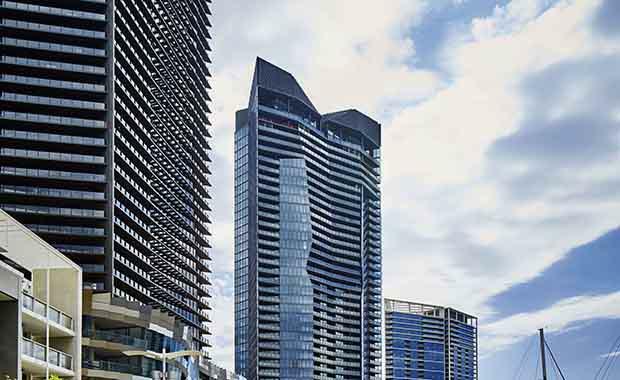 Redefining Melbourne’s skyline, the rooftop sculpture on Level 40 is symbolic of a crown, complementing Mirvac’s neighbouring T5 apartment tower, affectionately touted as the King of Yarra’s Edge. According to MP Report, the sculpture made of approximately 65 tonnes of steel, was erected onto Array’s rooftop over 12 weeks in 20 separate modules. , said Mirvac wanted to make both the rooftops of T5 and Array architecturally distinct to elevate the sight-lines down the busy street. “When people peer down Flinders Street they will now see, framed by the city’s mix of heritage and contemporary architecture, these two unique buildings crowned in sculptural steel,” Mr Carfi said. Currently still under construction, the building is 85 per cent sold, with residents expected to commence moving in in the first half of next year. “A large proportion of Array purchasers are empty nesters keen to downsize from more demanding properties in the suburbs. Array’s location, expansive apartment sizes and diversity of floor plans have been hugely appealing to buyers, with around 60 per cent of purchasers planning to own and occupy,” Mr Carfi said. “This area is forecast to be one of the fastest growing inner-urban areas in Victoria over the next 10 years, and Array purchasers are buying into an exclusive waterside lifestyle in a neighbourhood of award-winning homes with their own full service marina right on their doorstep,” said Mr Carfi.